CLIMATE: Cool winter with snow, warm summer. BEST TIME TO VISIT: Summer, Spring, Fall. COMMENTS: About 30 miles south of Bodie. 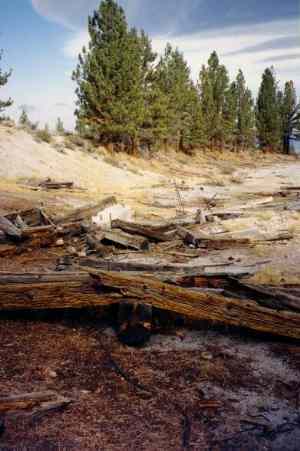 REMAINS: Crumbling lumber and a few foundations. 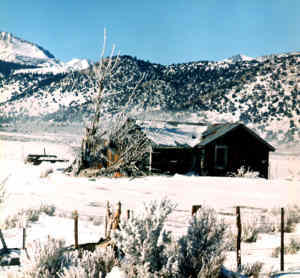 Mono Mills was built in 1880 as a lumber mill town to supply lumber to nearby Aurora and Bodie. 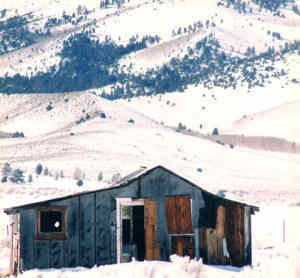 When Bodie's mines closed in 1914, the town of Mono Mills came to an end. There was at one time a railroad from Mono Mills to Bodie. Today there is nothing but rubble left; a few foundations and a lot of timber. Mono Mills, California. 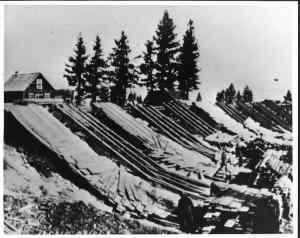 Shot shows the lumber slide, in which finished lumber is slid over the embankment from the planing mill, down onto the railroad track below. 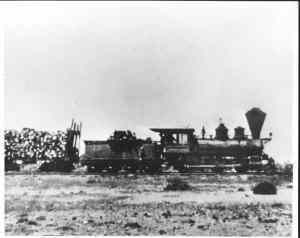 There, finished lumber is loaded onto flatcars on the Bodie & Benton Railway and taken to Bodie and points nearby. 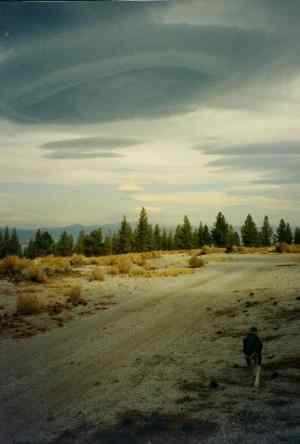 Photo courtesy of the Mono Lake Committee. In the woods south of Mono Mills. 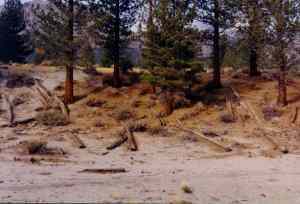 Trees from the virgin forest were primarily of Jeffery Pine, with lodgepole pine at about 8,500 feet and above. Today's trees are decendents from these felled trees, and are nowhere the circumfrance of these ancients. 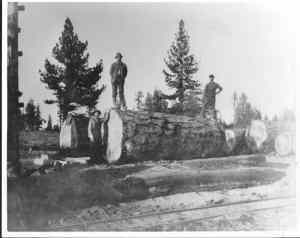 The trees were cut into cordwood and finished lumber. Photo courtesy of the Mono Lake Committee. A Bodie & Benton Railway locomotive and cordwood train northbound from Mono Mills and enroute to Bodie, 32 miles away. Photo courtesy of the Mono Lake Committee. Mono Mills, viewing north from millsite. 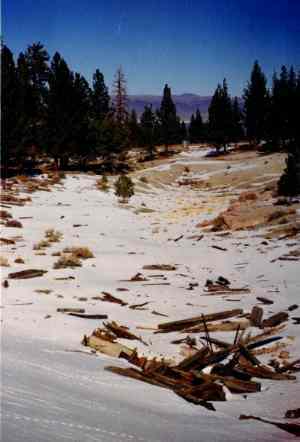 December 1989.
two giant wheels that are now found at the Lundy Lake, CA resort. 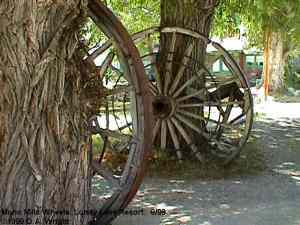 They originally came from Mono Mills, CA and are wheels once attached to a horse drawn log dragging apparatus to take logs cut from the forest to the railhead for final transportation to Mono Mills for reduction to finished lumber. Photo taken August 20, 1999. Remains of sawmill. October 1990. My dog trots along the grade of the Bodie & Benton Railway, view is northbound. October 1990. Lumber slide area below planing mill. Compare to historical photo. October 1990.